A BUBBLING CAULDRON: Uh-Oh. Look Out Gary - Here Comes John! The Orange County Registrar of Voters has updated his site with the latest numbers as of shortly after 5:00 Monday, November 12, 2012. It is anticipated that the counting will continue for a few more days before all ballots have been counted and the Registrar, Neal Kelley, can certify the election. You can read all the results HERE. 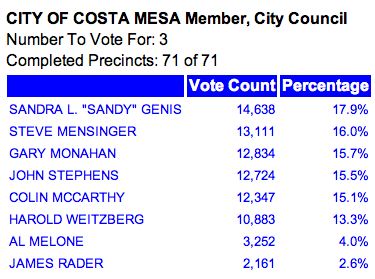 Sandy Genis stretched her lead over Steve Mensinger to 1,527 votes. Mensinger holds a 277 vote advantage over Gary Monahan. John Stephens has closed the gap between him and Monahan and that critical 3rd seat to 110 votes. Colin McCarthy remains well behind Stephens - 378 votes. According to the Registrar's site as an update at 5:24 p.m. this afternoon there remains 4,482 votes left to count. The gap widens in the Measure V race, with nearly 60% of the voters rejecting Jim Righeimer's Charter. 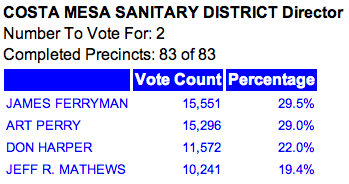 It would appear that the Sanitary District race if all but over with 4,828 votes left to count. 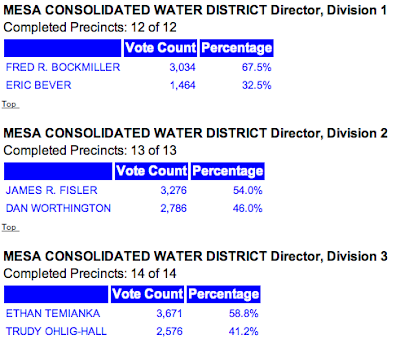 With only 730 votes remaining, Fred Bockmiller extended his lead over Eric Bever. 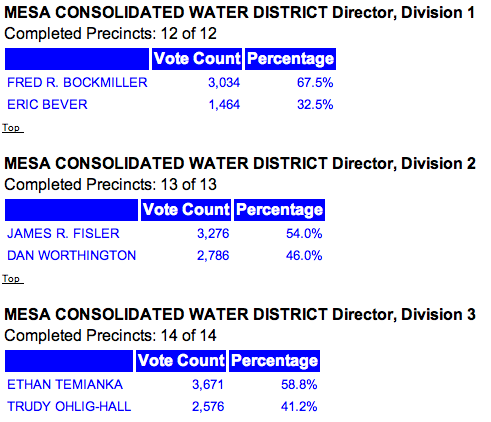 Ethan Temianka extended his over Trudy Ohlig-Hall with only 1,071 votes remaining. Dan Worthington made up a little ground on Jim Fisler, but not much. With only 685 votes left nearly 500 votes separate them. Nothin' left to do but smile, smile, smile!!!!" Hey, Scott Baugh,,,,You guys don't get it yet, do ya? Bad, bad news for Gaulieter Righeimer. He's already in big trouble with the Lincoln Club and the top brass. He and Mensy won't be able to chest bump their way out of this. The voters of Costa Mesa didn't fall for his charter scheme just like the voters of California rejected his other failures, Prop 174 and Prop 226. His gang of local enabler sell-outs have become particularly agitated in the last week as they see the writing on the wall and realize we will remember what they did long after their leader has moved on. Remember John Stephens's statement at the feet-to-the-fire forum? He said, "I've got your back." Looks like he was being literal... He's moving steadily up on Gary's tail. We may get some good news yet. Scott Baugh and company struck out in HB. Loss of 3 seats, big loss of face. Congrats Jill Hardy, Jim Katapodis, Dave Sullivan –nice conservative platform. The OCGOP leadership is just plain out of step with a lot of O C Republicans. Sure hope there aren’t going to be as many former Republicans as I heard. Yes OCGOP “leadership” wrecked the brand, and just couldn’t find enough Baaaaaugh sheep. Costa Mesa was not in the bag. It’s a loss, just not clear yet how big. Wasn’t old Gary supposed to be first? Scott made the call to dump Gary and pump up Steve and Colin, now Gary might just fall off the bottom. The party machine didn’t get his boys on the Sanitary board and only got one on the Water Board by lying. It’s clear the Baugh-Righeimer crony capitalists got no mandate, that’s for sure. Ethan you twerp, how do you feel about telling my neighbor that “Trudy isn’t really running, she’s going to retire, so could I just put this sign in your yard?” quite a few of my neighbors said your spiel was like that. You feel ok about it? You feel good about talking trash about a good loyal Republican woman who knows the water business inside out? Then you are a sick little boy. We also thought your day labor deliverers with the pre-printed “sorry I missed you” was insincere and cynical, like you. Too bad more people weren’t on to you. They will be. Nothing exciting ever happens in Costa Mesa. I think I'll move to Vegas or Reno. The extremists are starting to understand and make up new lies. Our local Neanderthal is already talking "voter fraud." We're sure the incompetent Riggy is already concocting an elaborate conspiracy rap wherein union thugs, illegal aliens, off-world aliens, Negroes from L.A., and Jenny Craig have somehow stolen votes in Costa Mesa. Gaulieter! hahaha! I can see old Jimbo protesting that the ballots should have been in the original German..
the Stephens surge is a little strange. I have been following other OC races where the one just out of the money like Stephens never makes up any significant ground. Not in any of the races, many with larger number of voters. The percentage of vote remains true throughout. This is one aberration we have here. Will be interesting if it is the only OC race with such a deviation from the norm. Don't forget Fitz. Many hundreds of Costa Mesans hope to see him driving his driving his golf cart off into the sunset! matty... What's "out of the norm" here is that 'provisional' voters are a little more intelligent that a percentage of those who just check boxes due to name recognition or vote for people who aren't even running. The worst enemy of the 3Ms are the voters who have taken a unobjective look at the issues and have taken note of who's been telling the truth and who's been lying. That's the reason for Stephens closing the gap. With nearly 5000 of those provisionals to still be counted, Gary is going to need all his leprecon's luck to hold on. Yes Mattie M (a 3m? ), this is one aberration here...just like Truman and Dewey!! I'm sure Gary thought he was sitting pretty, well the good people of Costa Mesa are making him think twice. The provisional votes are going to put John in the lead for the third spot and Riggy claiming voter fraud at every level. when I talk of contests I am watching I am not just talking the races here in CM though those are good examples of the percentages holding steady. I am talking races in HB, Rancho Santiago school Board, Orange Mayor, etc. All varied cities and electorate. As for checking boxes, Stephens gained about 500 votes for being in first position on the ballot. this is electoral science so don't blame me for reciting with a bunch of negative comments. Just read, then disregard if so inclined. Must you all be in a constant state of rage? we enablers will make sure there is money to pay the pensions by making the pensions reasonable again. We will have a dedicated police force with the malcontents leaving and those who love CM staying or joining us. We will improve infrastructure instead of paychecks. No new hires will be getting to retire at 50 years old at 160K a year. That is insane and an insult to taxpayers. Yep, the enablers will enable CM to become the shining city on the hill. Thanks OCGOP, we love you. Monaghan gains 13 votes today, leads Stephens by 123. "the enablers will enable CM to become the shining city on the hill." Meanwhile your family life already fell down the hill. Good work.